Erin is originally from Albany, New York. She received her Bachelor’s of Science degree in Biology from The State University of New York at Geneseo in 2013. While attending Geneseo she competed for the collegiate varsity swim team, and in her senior year was named Captain and served as the Chair of the Student Athlete Advisory Committee. Erin then attended Nazareth College’s Doctor of Physical Therapy program, earning her DPT in May 2017. 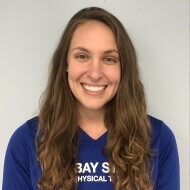 During her studies at Nazareth she chose to study Advanced Orthopedic Practice and Manual Therapy which provided her with an in-depth learning experience focused in function-based assessment and treatment of a multitude of musculoskeletal impairments. In addition to orthopedics, Erin really enjoys treating patients with neurological conditions and spent one of her clinical rotations caring for people at an intensive rehabilitation hospital. Outside of the clinic, Erin has spent a lot of her time as a swim coach for age-group kids. She enjoys sailing with friends on Boston Harbor and exploring the New England coastline on the weekends. She has run multiple marathons and aspires to complete an Ironman triathlon. Although she now proudly lives in New England, she will forever believe that “No one circles the wagons like the Buffalo Bills”.